Consul General Mr. Anil Kumar Rai called on Madam Yu Xiufen, Director General, Shanghai Municipal Administration of Culture, Radio, Film, & TV (SACRLT) and presented New Year wishes. During the interactions Consul General informed that in the past years, with assistance from CGI, Shanghai, India participated in international art festivals, film festivals, and other related international exchange events which had been organized by Shanghai Municipal Government and SACRLT. 2. 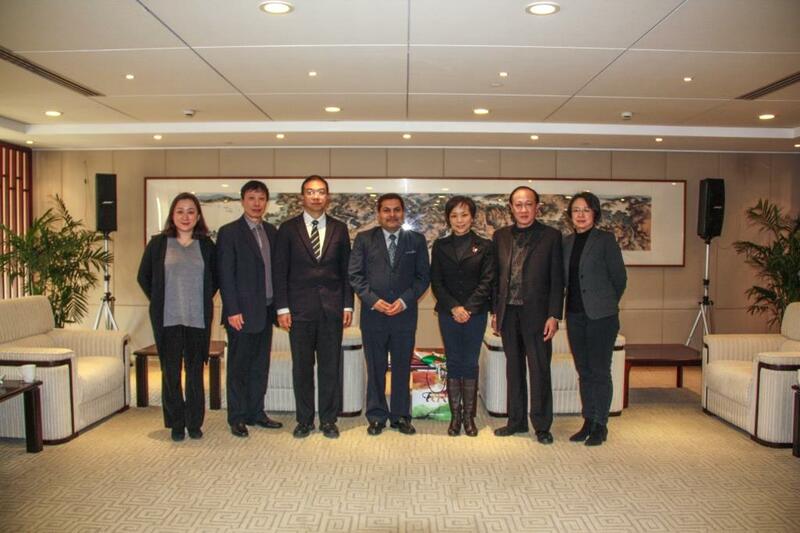 Consul General thanked the Bureau for strong support and cooperation in organizing various dance and other cultural programmes, which help promote understanding between Indian and Chinese people; and added that the Consulate was ready to continue participation and bring more cultural products, people, and artists from India to Shanghai. 3. Noting the popularity of Indian films in China, Consul General also informed that some of the Indian films have been felicitated by local organizations and institutions for their quality. Madam Yu stated that the SACRLT is planning to send a cultural delegation to India in the first half of 2018. The objective of the visit is to study Indian film industry and seeking help and cooperation with relevant counterparts. Consul General welcomed the delegation, and assured of facilitating the proposed visit to India.